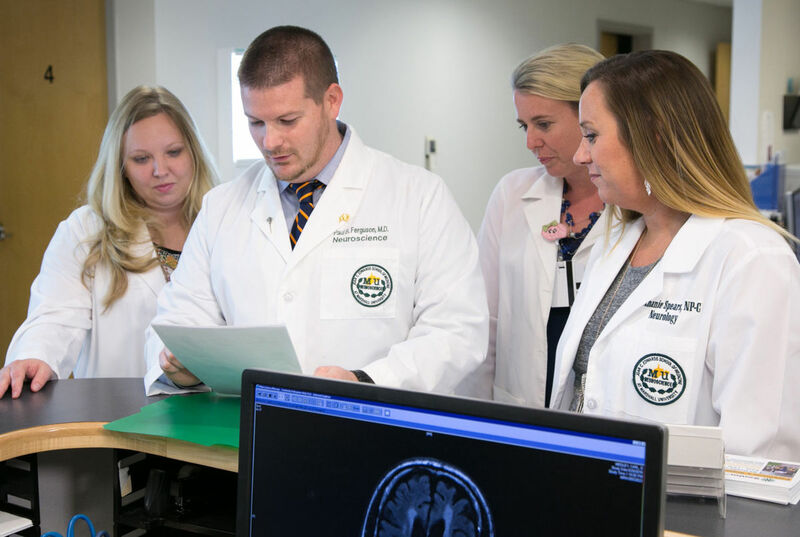 At Marshall Neuroscience, highly trained physicians and other specialists work together to provide comprehensive care and treatment for patients with disorders of the brain, spine and vascular system. At the Multidisciplinary Multiple Sclerosis (MS) Clinic, patients have access to a team of experts, including neurologists, a dedicated MS physician’s assistant, a dedicated MS nurse, nutritionists, psychiatrists and pharmacists, as well as the experienced therapists of Cabell Huntington Hospital Rehabilitation Services. The clinic is led by board-certified neurologist and chair of the department of neurology Paul Ferguson, MD. The clinic provides advanced medical treatments, neuroimaging and physical therapy for patients at all stages of MS. Short-term steroid therapies treat flare-ups, and disease-modifying therapies slow the disorder’s progression. Dr. Ferguson also evaluates and diagnoses patients showing early signs of MS.
Marshall Neurology is a Multiple Sclerosis Partner in Care Program commited to high-quality, multidisciplinary care and has earned the Marshall Neuroscience team national recognition. Cabell Huntington Hospital has been named a Blue Distinction Center Plus for Spine Surgery® from Highmark Blue Cross Blue Shield West Virginia, and the Advanced Primary Stroke Center has earned the Joint Commission’s Gold Seal of Approval. Marshall Neuroscience is home to one of only two accredited neurophysiology labs in West Virginia.